In KS1 children need opportunities to develop their mathematical reasoning across all areas of the curriculum. A carefully planned maths shape, space & measure area provides them with the resources they need to consolidate their knowledge and understanding. 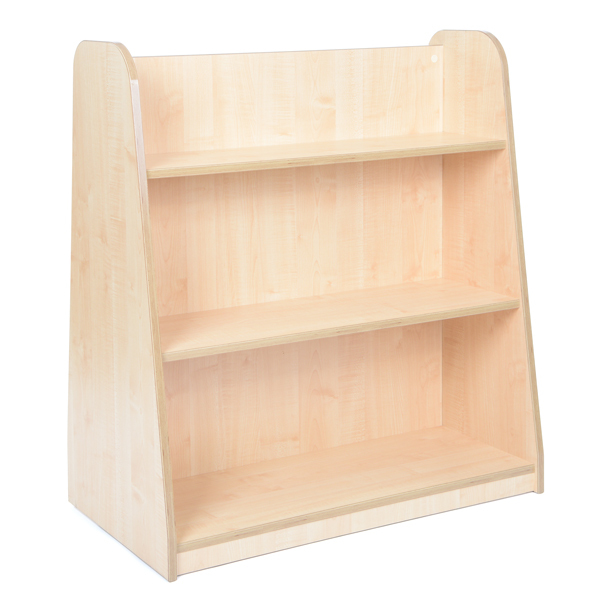 This Complete Maths Shape, Space & Measure Area offers a rich variety of opportunities to develop fluency, mathematical reasoning and approach problem solving in imaginative ways. For older children exploring, shape, space & measure through hands on, open-ended activities and games brings maths to life. 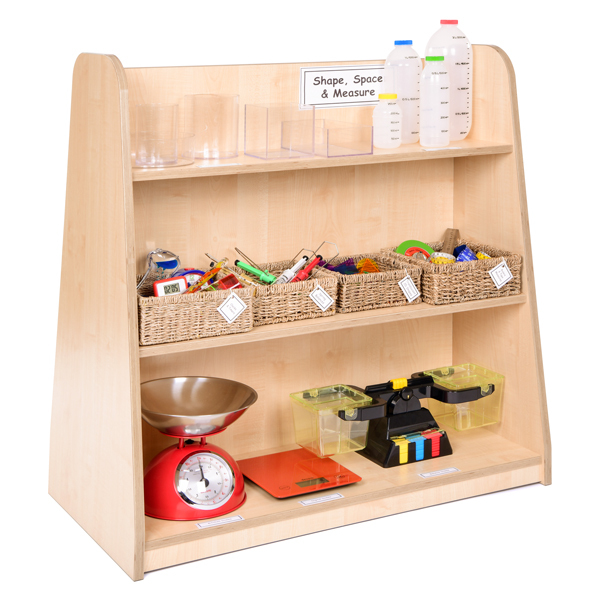 Although challenging to get right, a carefully planned maths shape, space & measure area provides a wide range of interesting, natural resources to sort, match, order and compare – experiences that lay down strong foundations for later learning. Litre Bottles Measurement Set –Set of 4 – 2 litre, 1 litre, 500ml and 250ml bottles. These translucent plastic bottles provide concrete representations of liquid capacity measures. The durable, seal-able bottles mimic familiar water bottle shapes and are perfect for children learning their units measures. Perspex Measure Set –Set of 5 – 4 x 1 litre containers in a range of shapes including cylinder, flat cylinder, cube and rectangle and 1 x 500ml cylinder. These containers all include clearly marked measures, making these easy to read. Set of Mini Sand Timers – Set of 3 timers – 90mm x 25mm – 1 minute, 3 minute and 5 minute. Robust colour co-ordinated sand timers giving accurate interval times for individual pupil use. 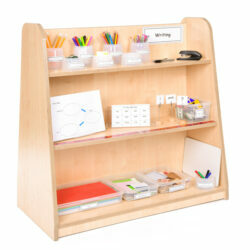 Ideal for use in maths, science and timed literacy activities. Stopwatch – 7cm – Easy to use stopwatch, large digital display shows minutes, seconds and 1/1000 seconds. Chunky design is ideal for small hands and simple three button function: green for go, red for stop and yellow for clear. Digital Timer – 65 x 65 x 13mm – Dual power functionality so it is always charged and ready to go. This digital timer can be used for counting, games and many other hands free activities. Lorus Time Teacher – 9 x 9 x 6.4cm – Designed to help children learn to tell the time, this clock has an easy to read dial with hours, minutes and quarter/half marks around the dial. The dial is also split into two to show ‘past’ and ‘to’ the hour. Glitter Wand – 40 x 8.5 x 7 cm – Children can watch the beautiful patterns and colours intertwine with this glitter wand and time how long the glitter takes to get from one end to the other. Tape Measure – 2 x Blue – 1m x 30mm – Chunky and easy to hold with bold 1cm and 10cm markings. Made in flexible, non-stretch and washable material. Metal Rule – 30cm rule – 33.5 x 4 x 0.2 cm full dimensions. Rugged rules made of stainless steel, Suitable for clean straight cuts on leather, cardboard, paper, thin wood etc. 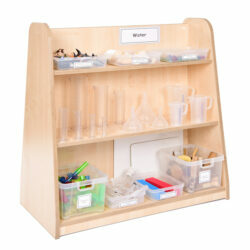 This practical set will guide children with measurements, also encouraging maths work. Set of Tape Measures – 2 x 150cm yellow metric tape measures. Full dimensions 8.5 x 5.5 x 1.5 cm. A set of tape measures for children to measure in pairs. Wind Up Tape 10m – Marked in centimetres and millimetres on one side and inches on the reverse. Winds back into sturdy case. 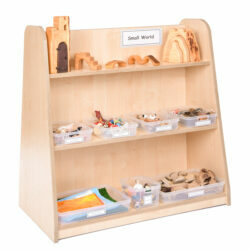 Supports maths measurement, personal development – collaborative play, communication and language. Set of Spring Balances – includes 0.5kg, 1kg, 2kg and 3kg spring balances. In addition to weighing suspended objects, these spring balances can also measure the force of pushing or pulling an object by using the extended rod. They are colour coded, calibrated in grams and Newtons and have a clear flat area on the rod where you can write your own scales. Coloured Translucent Shapes – Largest shape measures 5cm. Includes 14 different geometric shapes including hexagon, trapezium, rhombus, circle, triangle and square. The translucent properties allow these shapes to be placed on top of one another or paired together to create new shapes. Set of Oil Timers 1 x Round Large – 150 x 50mm, 1 x Dual Colour 130 x 95mm – Clear sensory liquid timer contains colourful mineral oil and water. 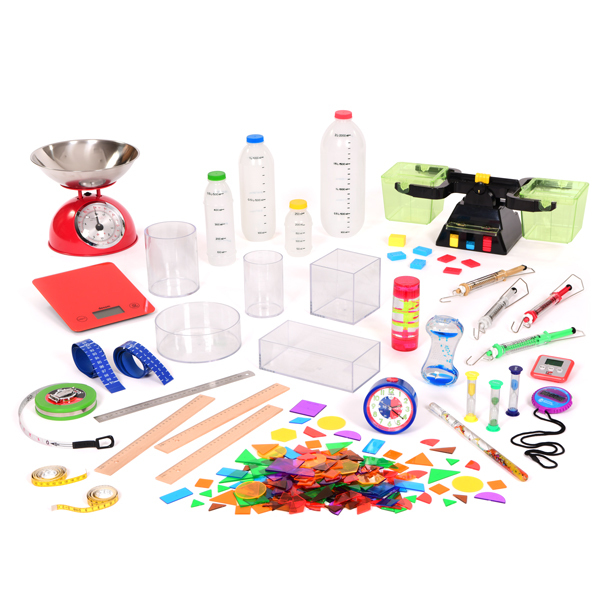 The set will captivate and fascinate children and are an ideal resource for quiet focus, as well as inspiring curiosity, developing creative language and understanding simple scientific principles. Measuring Balance – 1 litre measuring balance – Includes: Metal mass set (1 x 50g, 2 x 20g, 2 x 10g, 2 x 5g, 2 x 2g, 2 x 1g), Plastic mass set (2 x 20g, 4 x 10g, 8 x 5g). 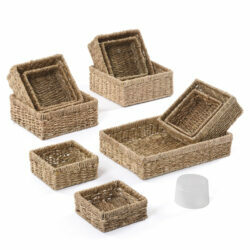 Graduated clear buckets with lids which act as small containers for measuring. Red Novo Scale – 27 x 27 x 16.2 cm – 5kg stainless steel kitchen scales with large removable two litre capacity bowl. Easy to read scales with measurements shown in both metric and imperial. Red Electronic Scales – 22 x 19 x 2 cm – 5kg stainless steel digital scales. Touch on/off button with self-lighting LCD screen. Wipe clean stainless surface. 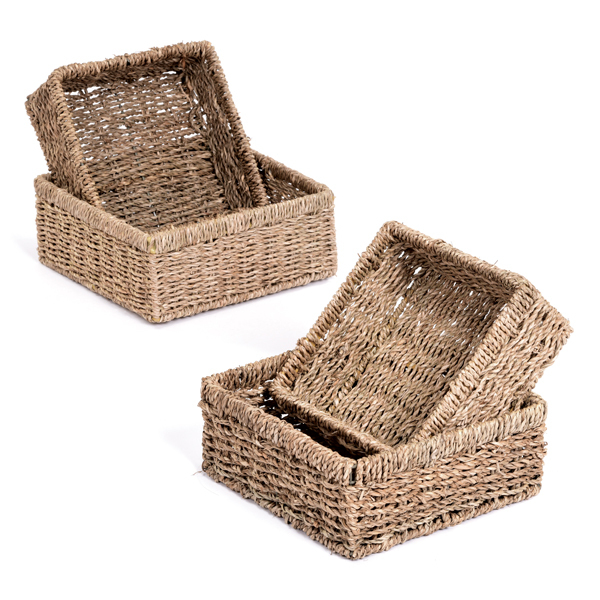 Set of Square Seagrass Baskets – 2 x Medium Baskets and 2 x Large Baskets.